When you find yourself in a serious relationship, and are a man, you’ll find that you will probably have to make sacrifices every once in a while. This may mean doing someone else’s laundry, picking up feminine hygiene products from the store, or even sitting down to watch something you wouldn’t otherwise watch. I am one of these people saddled with the responsibility of keeping the woman I love happy, and these are the things she’s made me watch. My girlfriend, Lynn, has interesting tastes when it comes to television and movie viewing. Sure, she watches The Walking Dead, American Horror Story, and Mad Men, but she’s also got a soft spot for some of the trashiest television available to the American public. She’s also an equestrian, so when she wanted to watch the horse-centric television drama Heartland on Netflix, I couldn’t wait to watch something other than snotty women bicker at each other while a camera crew watches. I must say that, although I was skeptical about watching a show about horse people (not literally), if you leave cynicism at the door, Heartland is actually quite an enjoyable, wholesome drama. For those of you that aren’t Canadian, Heartland is shot in Alberta, Canada and airs on the Canadian CBC and has aired 104 episodes since 2007, plus a 90-minute Christmas special. Based on the book series by Lauren Brooke, the show takes place at the titular Heartland Ranch, which is a clinic that attempts to solve the issues of troubled horses. When mom and horse whisperer Marion dies in an accident while trailering an abused horse, the ranch is left in the hands of her father Jack, her teen daughter and protégé Amy, and her older daughter Lou, who leaves her life at a high-powered New York business to make sure the ranch stays afloat in the wake of the accident. Lending a helping hand is Ty Borden, a troubled kid looking to work off his probation and Mallory, the young neighbor who can’t stop talking and seems to be in everyone’s business. Heartland is cut from the same cloth as American shows such as 7th Heaven and Gilmore Girls, which is a refreshing change of pace among the cynicism that seems to be permeating the American television landscape. The show has an underlying theme of healing through love and compassion and there’s not an ironic bone in the show’s DNA. What’s absent from it that those other shows contained is the heavy-handed Christian message of 7th Heaven and the mile-a-minute snappy dialogue of Gilmore Girls, but fans of these shows should find something that they may like in Heartland. The notable star is Amber Marshall, who plays Amy, the girl tasked with picking up where her mom left off with the horse-healing business. She has to deal with losing her mother so young, keeping the business going, and a lot of other drama, including reconnecting with her estranged sister and father. The young actress does a really good job handling a lot of the heavy lifting with the storylines as well as a fair amount of her own stunts while on horseback. With an equestrian girlfriend, our watching would most likely had been cut short if the show lacked people that could at least fake a little bit of riding, but the show seems to do well with keeping the use of stunt doubles to a minimum. Amber looks like she knows her way around a horse and probably can do more than what the show would allow. With a mostly Canadian cast, there aren’t too many familiar faces in it. Beau Mirchoff, who plays Matty in MTV’s Awkward., has a six episode arc in the show’s first season but other than that, the only notable credits from any of the leads are Amber Marshall’s starring role in The Elizabeth Smart Story which aired on CBS in 2003 and Michelle Morgan’s turn in Diary of the Dead. Other than that, the cast is about as faceless as you can get, at least for American audiences, but it is a tight-knit group of regulars that just have such chemistry together that it feels like a real family. At the head of this family is patriarch Jack Bartlett, played by veteran Canadian actor Shaun Johnston. 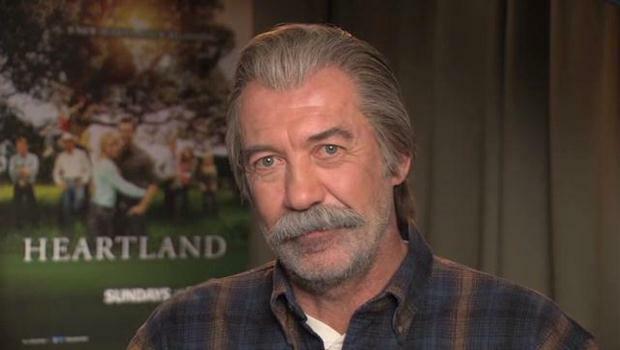 Imagine a Canadian version of Sam Elliott and you have Jack Bartlett. Jack happens to be my favorite character, if only because of my love for Westerns and he plays the old grizzled western man perfectly. I admire a man that can grow a good mustache and Shaun Johnston’s makes me wish he were my granddad. An unsung hero of the show is the wilderness landscape of the Canadian Rocky Mountains. It’s a setting that adds to the feeling of a simpler lifestyle and wholesomeness, almost harkening back to Little House on the Prairie, though it never reaches the preciousness of the Laura Ingalls-Wilder story. Heartland is a great family show. Like 7th Heaven and Gilmore Girls, families with young children can feel confident in watching the show without questioning its content. Its continuing theme of the power of a strong family and the importance of compassion is a refreshing change over the current television landscape. With a unique setting in the Canadian Rockies, it sets itself apart from similarly themed shows even if the storylines are somewhat familiar. No, I will not watch this show. No, I will not watch this show. *Signs on to Nextflix* Damn you, Anthony. Do it! You won’t do it. Horses used to be a man’s domain. Women have taken over in the past 50 years or so. I belatedly enjoyed your review. As you can see, I am a late comer to this show; I recently discovered it on Netflix and UP TV. I was immediately hooked. It is a refreshing return to moral fiction (in the best sense of the term coined by John Gardner) accomplished with a beauty and grace that I find irresistible. The writers provide great material, well executed by the actors, that produces a rare combination of dramatic and comic catharsis. As the main writer said within an interview, she seeks to pull the audience through a knot hole within the space of a few minutes. The series accomplishes this goal consistently, which is the reason it has such a large and loyal international fan base. Finally, in the words of a sermon I once heard, there is a universal heartfelt desire to return home; this is reflected within the frequent refrains from Jack and Amy when faced with changes: “I hate change!”. This series provides its audience with an idealized version of the earthly home we long for that can only be achieved within another realm. Answer to your belated review. I agree with your opinion wholeheartedly, Gary. Heartland definitely is, as you put it, “return to moral fiction”. It is a family-friendly show, that can be enjoyed by all generations, and each generation will find a story line they can relate to episode after episode. That’s what I like about Heartland the best. As well as the positivism on the show. Nowadays, TV shows are so filled with death and murder, that it is refreshing to see a show, that manages to mostly avoid these topic and portray struggles real people go through on daily basis. I’m not sure if anyone else has said or picked up on this. I have yet to see a tv in this show. At least not in the homes. Sure they have cell phones and computers, but it’s a nice breath of fresh air(no pun intended). LOVE THIS SHOW! Kudos for the excellent write up.